Starting a business is one thing, but growing an electrical contracting business is quite another. We’re not a coaching or mentoring business, but we know a thing or two about business, so we’ve put together this guide to help point you in the right direction. When we’re talking about growing a business, ultimately we’re talking about growing the revenue of the business. Sure you could look at growing your team, growing your capabilities, growing your number of contracts etc, but ultimately it’s still all about growing your revenue. So how do you grow your revenue? You need to win more jobs, or increase the size of the jobs you win. It’s not rocket science, but it’s not easy either as we see plenty of electrical contracting businesses that fail to grow or fail to even stay in business. We hope this guide gives you a solid start on how to grow your electrical business, regardless of whether you’re a one-man start-up or have been around for years with a team of staff. The first thing to do is get your systems working efficiently. There’s no point winning more jobs and growing your business if it all gets choked up in your systems. The other benefit is that even if you don’t end up growing your revenue by a huge amount, you might end up increasing your profitability thanks to more efficient systems. And you know, sometimes increased profitability can be a lot more satisfying than increased revenue. As part of making your electrical contracting business more efficient, you need to start using job management software to manage yourself, plus your team if you have one. We won’t go into the features and benefits of each different job management option, but we will say that in our experience there is no single system that stands out as the best. Some electricians swear by option A, whilst others love option B and some prefer option C! Paperwork is a killer for trade businesses, so make sure the financial side of your business is working efficiently. There are a few options here, but personally we have experience with Xero and can definitely vouch for its ease of use and the benefits it provides for your business. Cloud-based accounting software such as Xero will also integrate with most of the popular job management options, making invoicing a more seamless process. 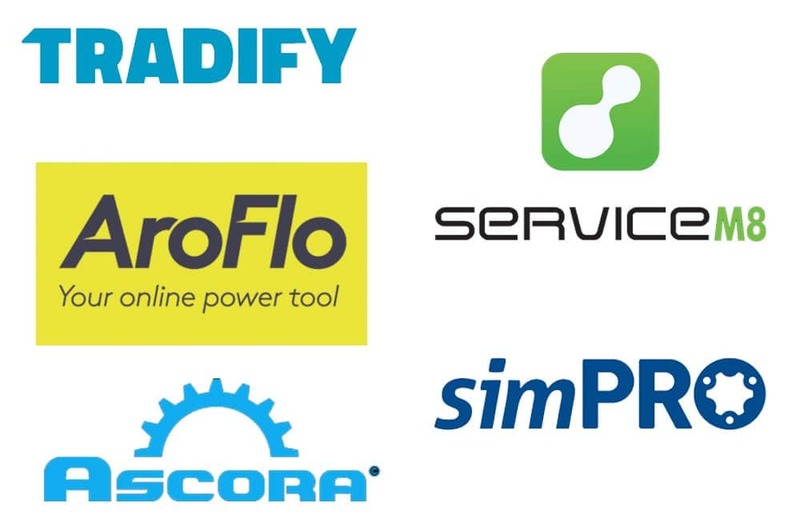 Whilst job management and accounting will be your most important apps, there are plenty of others that can help to make your electrical contracting business run more efficiently and effectively. Our mates at PROTRADE United put together a guide on the five most useful apps for a tradie which you can read by following the link. Now that your office functions are operating efficiently the next step is to get your branding up to speed. There are plenty of thoughts around what is ‘branding’. Some people simply thinks it’s your logo and business card etc, whilst others consider branding to be virtually everything in your business that impacts upon a client. Before we get into the more exciting part of marketing, it’s important to ensure you’re starting from a solid base. There’s no point investing a heap of cash into a marketing strategy if clients are going to be turned off by the basics. The reason we need to get this right is that if you want to win more business and grow your revenue, you need to have the appearance of a business that deserves more business. Depending on how you want to grow your business, you might need to look at your business name to ensure it is still relevant. For example if your business name is “Shane’s After-Hours Electrical” and you’re wanting to grow by winning more commercial fit-out jobs, that name might need to be changed. Of if your business is called “Albany Creek Electrical” and you want to win jobs by serving a larger geographical area, again you might need to look at changing your name. Perhaps you just want a more corporate sounding name? “Shane’s Electrical” might have been great as a one-man business servicing local residential clients, but if you’re now chasing big commercial jobs it might not be so fitting. If you’re about to embark on a big growth strategy, it’s far better to go through a name change now rather than waiting until you’re already big. If you don’t have a logo already, you need to get yourself one ASAP! If you already do, take a good hard look at it and decide if it represents the business you want to be. Often as a start-up business you keep costs to a minimum. You might have designed your logo yourself or had a friend do it. Or you might simply have gone with a cheap graphic designer. Either way, your logo does have a big impact, so you need to ensure it’s as sharp as possible to give that good first impression. The internet has made the cost of accessing quality designers very low, and you can get yourself a great logo now for until a thousand bucks. Just like your logo, your business card is an important part of that first impression. As with logos the cost of having a professionally designed business card is fairly low now, so it’s definitely worth investing a few hundred dollars into. If you’re also having a new logo designed, you’ll find that throwing in the business card and stationery design won’t cost you a whole lot more. This includes everything such as your letterhead, quote and invoice templates, and even presentation folders if you really want to ramp up the profession appearance. Think about a family or a business sitting down to compare quotes or proposals. If one electrician has a nice cover letter and quote template, all presented in a nice folder, and then your quote is on a plain piece of paper or maybe an average looking template, your competitor already has a big jump on you. The client might decide to accept your competitors higher quote as they feel that the other electrician’s high level of presentation is a representation of the quality of their work. It might be, it might not be, but the only thing that matters at this point is the client’s perception. Decent letterhead and stationery design doesn’t cost a great deal, but it could have a big impact when trying to win jobs. Very similar to the above points, a professional uniform helps a lot with that initial perception that the client will form about you. Turn up to quote the job in a high-vis or khaki outfit and the client might see you no differently to every other electrician, but turn up in a nice polo with your embroided logo and you instantly look more professional. Basic vehicle signage can fall into the same category as above, in simply making your business look more professionally. A vehicle with the company name and logo is always going to look more trustworthy than a plain white van that could have come from anywhere. But your work ute or van can be more than just a first impression, and can actually be a business-generator in its own right. Whilst a full vehicle wrap isn’t cheap, it can have a massive impact out on the road if you get it right. Not only will other people on the road be exposed to your brand every day, but your business will also appear larger and more professional. We’ve listed a website last in this section. At this stage when we talk about your website, we’re just looking for a basic website that looks good, works well and can be found in Google when someone searched for your business name. Even if you expect to get a lot of your business from referrals and work of mouth, these people will still often check a company’s website before making the initial contact. What’s the point of generating great word of mouth, if when people Google you they find a crumby website that leaves them feeling less keen about calling you? So at this stage we just need a functional website that looks good and is easily found. Things will change though, so keep reading! Many electricians, and all trades for that matter, have the dream of “getting off the tools”. This can mean different things to different electricians. For some it might simply mean spending more time on quoting rather than doing the physical work all day every day. For others it might mean having no involvement in the day-to-day electrical business whilst they are free to pursue other options for business or pleasure. In terms of growing your business, getting off the tools is important so that you can spend more time on the business rather than in the business. It’s an old business cliché, but it’s so true. You’ll never be able to grow your electrical contracting business if you spend all day on the tools. You need time to work on strategy, process improvement, relationship building and chasing new opportunities. 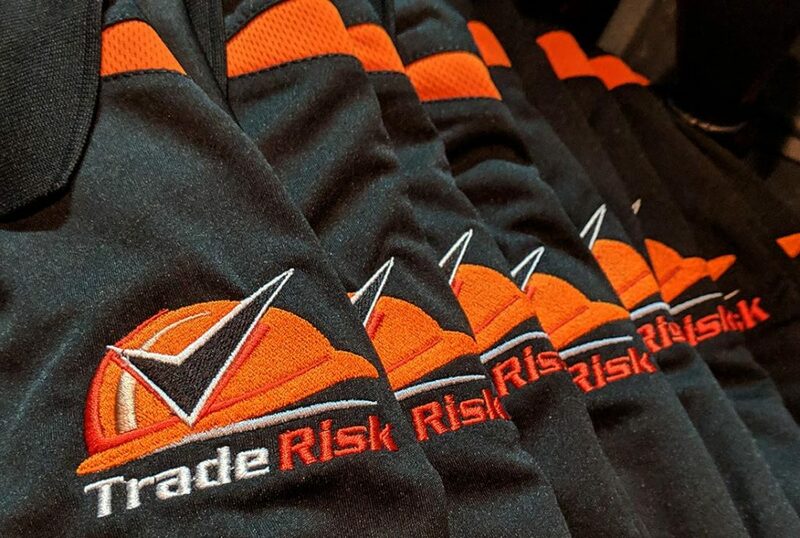 We’re not experts in this area, but the team at PROTRADE United certainly are. They’ve put together a guide called “5 Steps to Get Off the Tools” which you can access by following the link. Now we have all the basics right. Your back-office is ready to go and all of the foundations of your marketing have been laid. We’re assuming that everything else is in order, in terms of your staffing and capabilities. These aren’t our areas of expertise so we’ll leave that in your hands. There are plenty of different ways to market your electrical contracting business, and each separate idea could justify a separate article on its own! So we won’t be going to deep on each of these ideas, but you should be across the basics. Most people are familiar now with Google Ads. They’re simply the first three or four results at the top of the search page when you do a search in Google. Up until recently it was known as AdWords, but now it’s just Google Ads. 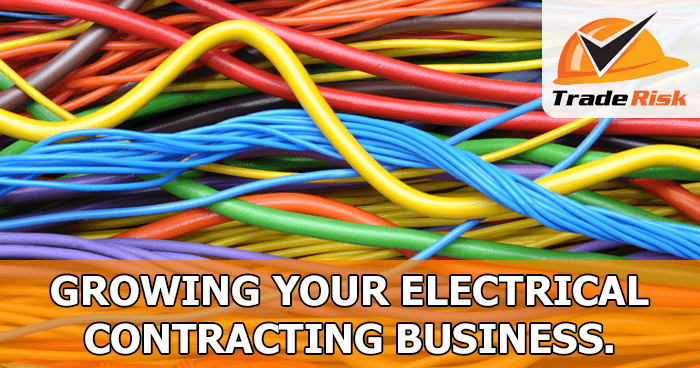 Does Google Ads work for an electrical contracting business? We can’t say yes or no because we’ve never tried, but there are plenty of electricians advertising in this way. On a very basic level, Google Ads works by targeting particular keywords. For electrical contractors, targeting searches that include a suburb name seem to be the easiest way to start. 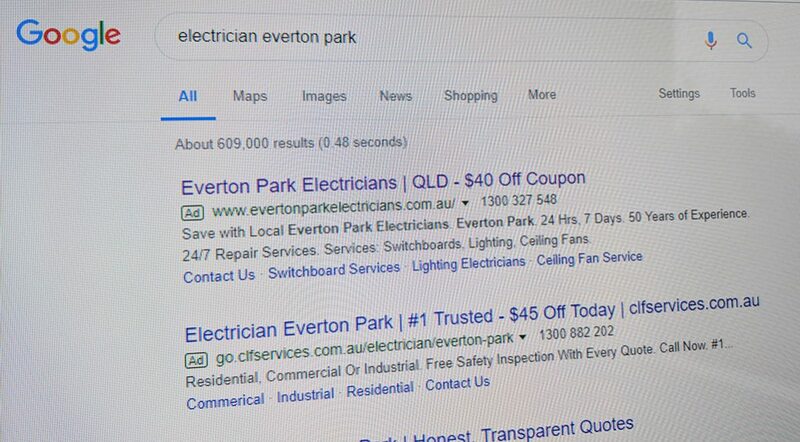 For example if you’re based on the northside of Brisbane, you’d want to target keywords such as “Electrician Stafford”, “Electrician Everton Park” and any other suburb you’d be happy to receive enquiries from. From here you can get incredibly specific in how you target your ads. For example if you just want to chase after-hours work, you could target your ads to only show between certain hours. Conversely if you want to avoid after-hours work, you could set the ads to not show outside of standard hours. We recently put together a dedicated article on Google Ads for tradies, so it’d be worth reading that guide for more detailed information. If you are going to invest money into Google Ads, you need to ensure you’re converting as many of these enquiries as possible. After someone clicks your ad the first thing they’ll see is your website. You need to ensure your website looks trustworthy and professional, so that the user wants to take the next step rather than simply clicking “back” to the search results. You need to work out what you want the user to do once they land on your website. Do you want them to call you, do you want them to complete an enquiry form, or are you happy for them to do either? This is the critical point that will decide whether that click turns into a lead. Then you need to ensure you’re following up your leads in the most efficient way. It’s great that a user has clicked your ad and your website has converted them into a lead, but if you don’t follow up the lead it’s all for nothing. So have a system for following up leads, and follow them up more than once! Wouldn’t it be great if you could get all of those website visitors from Google, but didn’t have to pay for the ad clicks? You can! But it’s not always easy… Search engine optimisation is the process by which you get your website to rank in Google as high as possible. And the higher you rank, the more website visitors you’ll get. Back in the old days, say 10-15 years ago, you could put together a basic website splash the phrase “Sydney Electrician” all over it, and suddenly you’d be ranking in Google for anyone searching for an electrician in Sydney. These days it’s much more difficult, but definitely not impossible. Some so-called experts will tell you there are all sort of tricks and magic to get strong rankings, but our experience is that nothing beats having plenty of relevant, fresh, high quality content on your website. This is something that could take an entire article or two on its own, but the key to search engine optimisation really is just keeping your website up to date with plenty of information. Grabbing a few backlinks where possible is also very helpful. Social media has been around for well over a decade now, but it’s still very much a new technology for many electrical contracting businesses when it comes to marketing. Whilst Facebook, Instagram, Twitter and LinkedIn (to name a few) all fall under the social media banner, they are all quite different from a marketing perspective. Our experience has been that Facebook isn’t particularly amazing for marketing a trade business, but it’s still essential to have a presence in case people do go searching for you. Personally I will look up any company on Facebook before I consider using their services. I want to see their reviews, see what people are commenting on their posts and simply see that they are an active business. So even if you’re not planning on being super-active on Facebook, you should at least have a business page and keep it regularly updated. No every week or even every month, but don’t leave it six-months or more since your last post as it may appear that you’re no longer in business. For electricians and all other trades, Instagram definitely seems like the place to be. I’d say that Instagram is better for building connections between the trades and builders rather than directly with clients, but that’s not a bad thing. An easy strategy here could be to build up your profile to a decent level, then use paid promotions (which can be very cheap) to get your posts showing up for more builder or whatever you choose to target. That will get your brand in front of them, and then you can start engaging with them by liking and commenting on their content. Once you build up a bit of an ‘Instagram relationship’ you might find they come to you next time they need some electrical work quoted. So if you want to win more work from builders and other trades, being active on Instagram and showing off your work and capabilities is definitely a good way to do it. We’re not big users of Twitter, so we don’t have much to say about it. Being a less-visual medium compared to Facebook and Instagram makes it far less appealing for this type of business. This is an interesting one. Whilst LinkedIn could be considered more white-collar than blue, that doesn’t mean it’s not relevant for growing an electrical contracting business. If you’re chasing big commercial jobs you might find yourself dealing at more of the white-collar level anyway, especially if you and the other you are dealing with are all business owners. So we can’t say a lot about LinkedIn, but it might be worth a look. We’ve mainly concentrated on the online area when it comes to marketing, but there is so much more you can do. You can sponsor local sporting teams or groups, you can do print advertising in local papers, your can do letterbox drops and magnets, you can do billboards… the options are endless! Then you have the more personal-touch options, such as joining networking groups, trying to get introductions to builders. Again, the options are almost unlimited. We won’t talk much about those options, as our expertise really is more around branding and digital marketing. We certainly hope you’ve taken something positive from this article. Although it’s quite lengthy and covers a lot of topics, there is so much more to know if you really want to get it right. That’s where your competitive advantage could come from… Most other electrical contractors won’t want to invest the time of effort into learning all of this and then implementing it. If you do, you’re giving yourself a massive advantage. All the best with growing your electrical contracting business, and if there’s anything we at Trade Risk can do to help, please let us know!